Six keycard RKCB has come of age! As soon you identify a double fit, don't ask for keycards… just "launch" and tell. 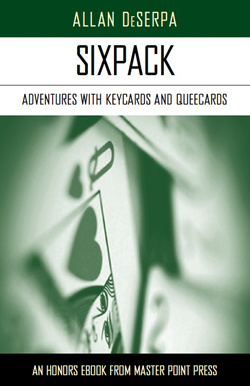 You can find out about all six keycards — and two "queecards" — below the game level. Part I of the book lays out a set of basic rules for any casual partnership to apply quickly and easily. Part II gets more advanced and complex, but operates along the same principles. Apply Sixpack throughout your notrump structure and expand it to a wide range of standard bidding situations. With many examples and four extensive quizzes for partners to practice the convention together, Sixpack gives the reader the experience and confidence to use the convention effectively at the table. Allan DeSerpa is a professor of economics at Arizona State University. He continually dabbles in bridge bidding theory and, every ten years or so, he writes a book. Other titles include The Mexican Contract (1980) and Principles of Logical Bidding (1997). His motivation for writing Sixpack? He woke up one morning and decided that the sixth keycard deserved more respect.